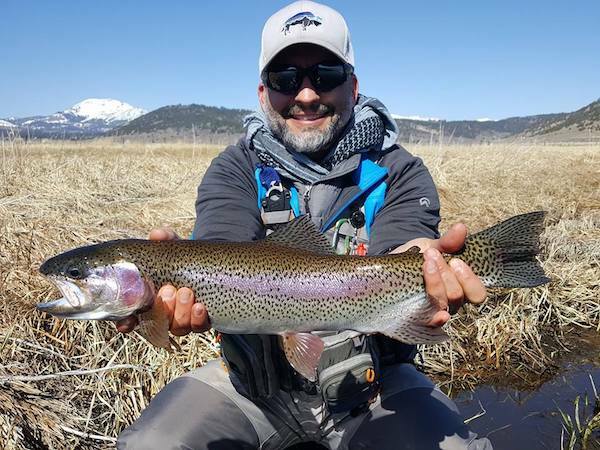 Check out this gorgeous rainbow Sean Evans C & R on his trip with Doug Dolan. Congrats Sean! The run-off has really slowed due to cooler temps, making for better water conditions. Numbers are decent here during warmer periods; with fish holding in the deeper slots and pools. Best bite occurs during early afternoon when the BWO’s are emerging. Large midge hatches coming off during a high barometer. Dry dropper rigs with a #16-18 Para Hi-Vis BWO and a #22 Gillie dropper 12″-18″ below is a consistent rig currently. When you observe those noses sipping the adults in the suds, remove the dropper, and dope up those high wings so they ride high on the surface. Longer leaders, & light tippet in the 5-6x class is best. During off hatch periods try attractor patterns fished with/without an Under-cator. You can get into some of the larger fish using this method during the spring months.